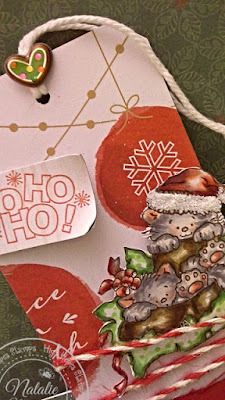 I used a die cut tag and covered it with some festive cardstock. Used a candy cane twine and added a bell and glitter. 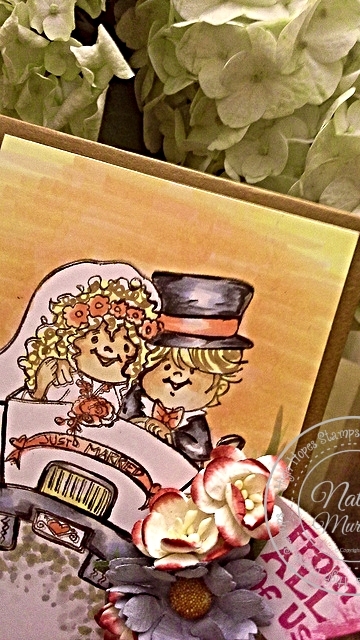 My image is coloured with Copic Markers, fussy cut and pop dotted into place. An added heart sticker and a sweet sentiment to complete the tag! Now that September is almost over, that means we are getting closer to Christmas. Definitely time to start stocking up on the Christmas cards. One of my favourite things about Christmas is having family and friends around. 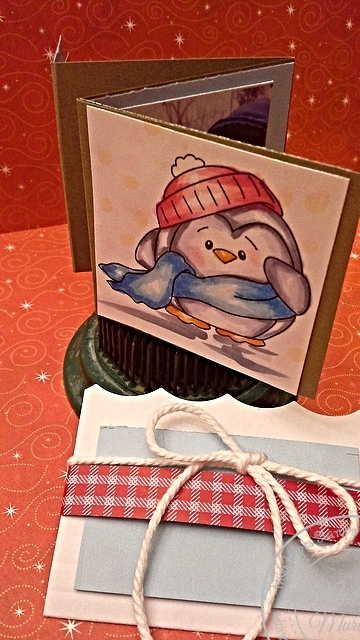 For today's card, I have used the adorable Penguin Giver from High Hopes Stamps. It is a CAS style card. This last month has been full of birthdays, both family and friends celebrated the big event, so it's been a very busy month. Boy's cards are super hard to find so I just had to design this little fellow into a card for the big event! This adorable image is Jumping Party Robot from High Hopes Rubber Stamps. I have colored him with Copic markers and then fussy cut him out. The designer paper is from Bo Bunny and the sentiment is from My Sentiments Exactly. 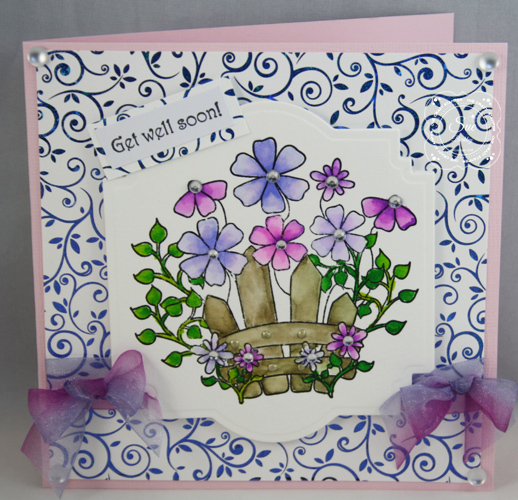 I used good old fashioned pinking scissors to make the border around the sentiment. 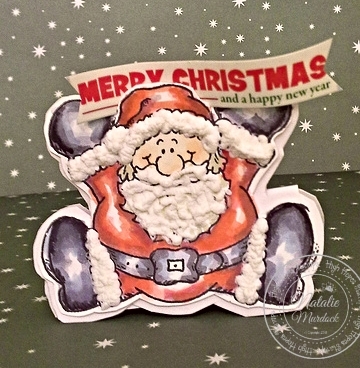 Large Stackable Santa found here! I like this Santa a lot and have used him in many projects. I decided to make a cut behind his hat which holds the banner. A name place card holder for a Christmas table could also be added to Santa's hands but I decided to use a greeting instead. Basically the place card holder is made up of three parts. Everything was hand cut without any dies. 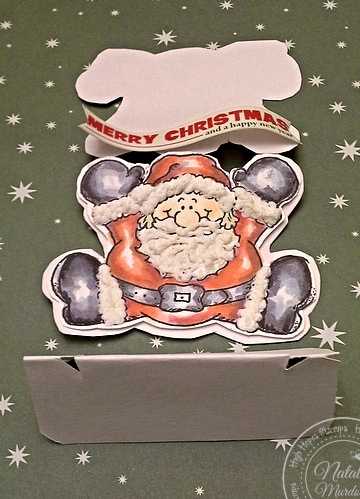 A folded piece of cardstock, Santa image and a card that was traced around the image. 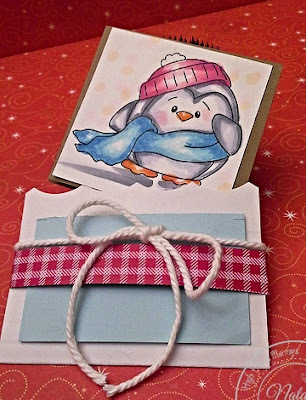 The folded cardstock goes between the card to hold it together and keep the image upright. Now that September is nearly over and the weather is getting cooler, that means more colds and feeling under the weather. For today's post I made a CAS card that could be used as a Get Well Card. 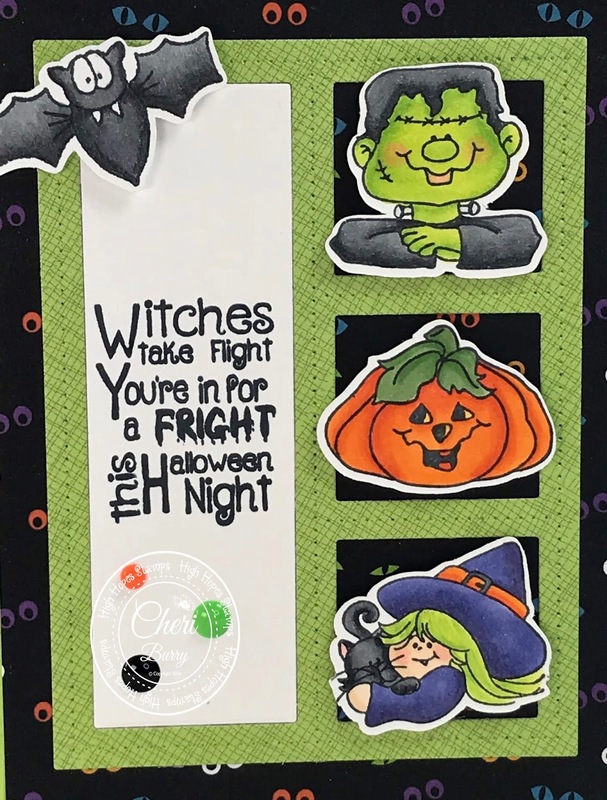 Instead of using design paper, I used Gina K. Designs Vibrant Vines Foil-Mates with a sheet of Brillant Blue Fancy Foils. 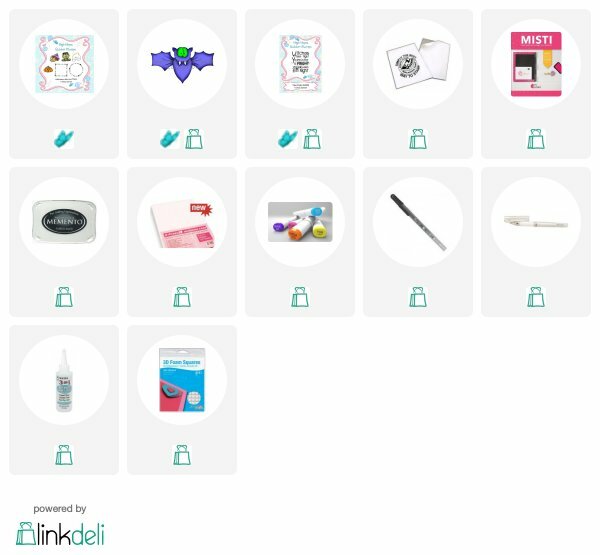 This was then foiled using the Minc machine. Unfortunately, the photo isn't showing the sparkle in the foil. 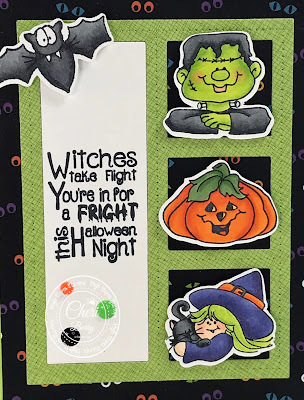 The image was stamped with Staz On Jet Black ink on some water colour paperand coloured with Zig Clean Color Real Brushes. 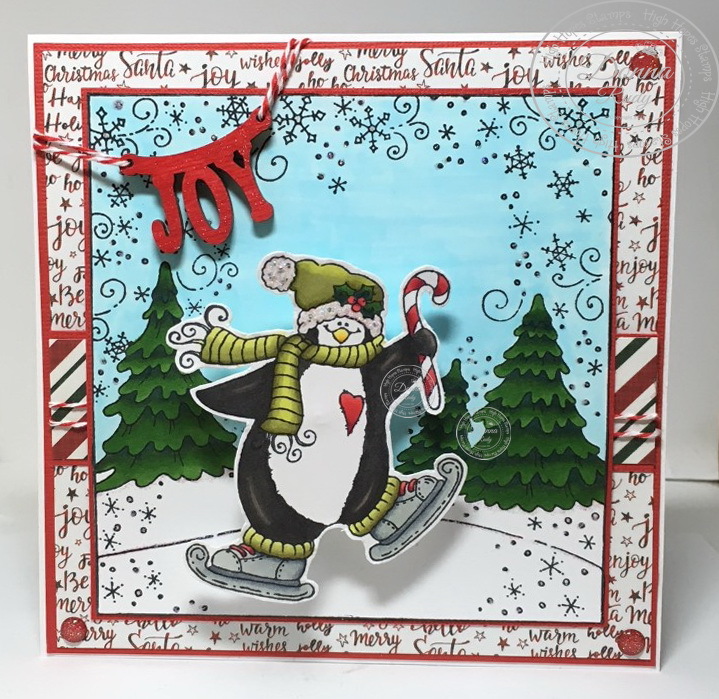 For my inspiration post this week I decided to colour up a fun winter stamp called Candy Cane Penguin. 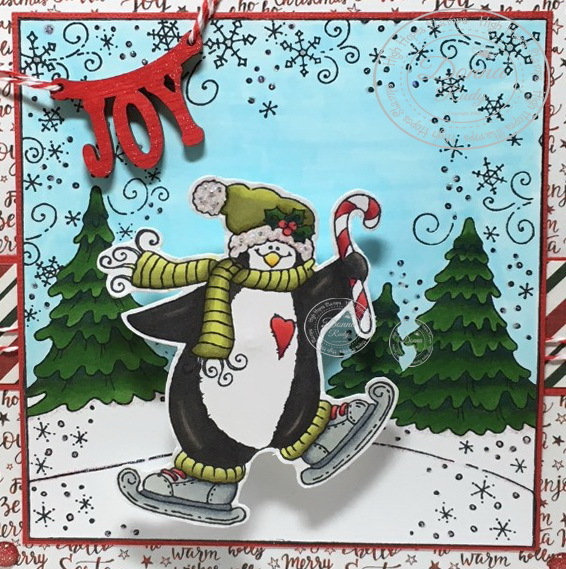 How fun is this penguin - he sure is happy!!! Sometimes you just need to jump for joy - no matter what the reason, just jump and let out pure and outrageous joy! First I coloured up my winter background and added some Stickles to some of the snow flakes and snow banks. 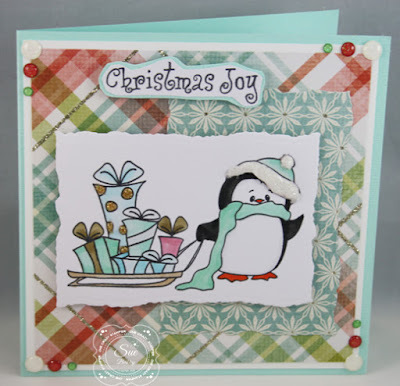 Then I coloured the penguin and fussy cut him leaving a thin white edge. Since he is sooo happy I decided to put him on an action wobble so he wiggles and jiggles. The sentiment is a wood cut out that is coloured with a red sparkle pen - the sparkle is hard to see in the picture but it really is sparkly! 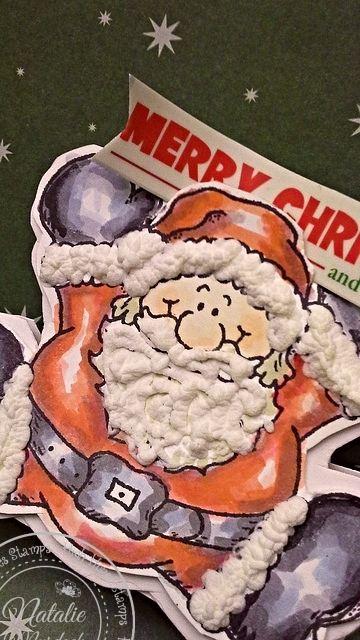 Some twine and sparkly gumdrops finish off my card. 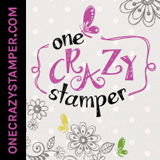 Don't forget to follow the One Crazy Stamper blog or Facebook page for daily inspiration! 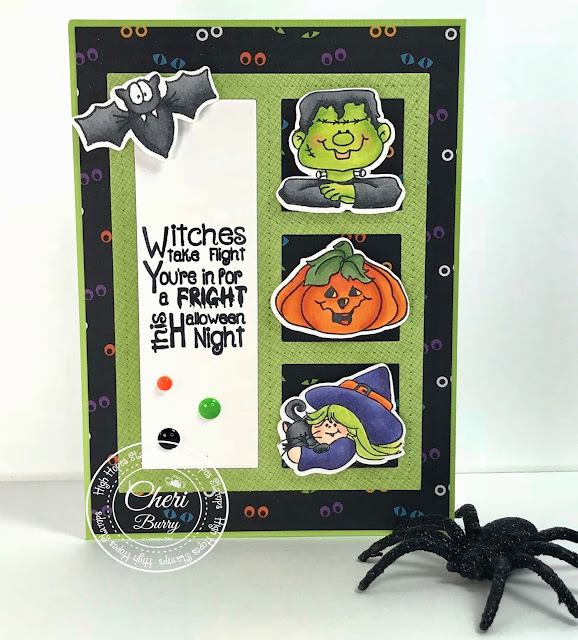 Fall is in the air here in British Columbia, and with that in mind my thoughts turn to Christmas and all of the cards I need to make. 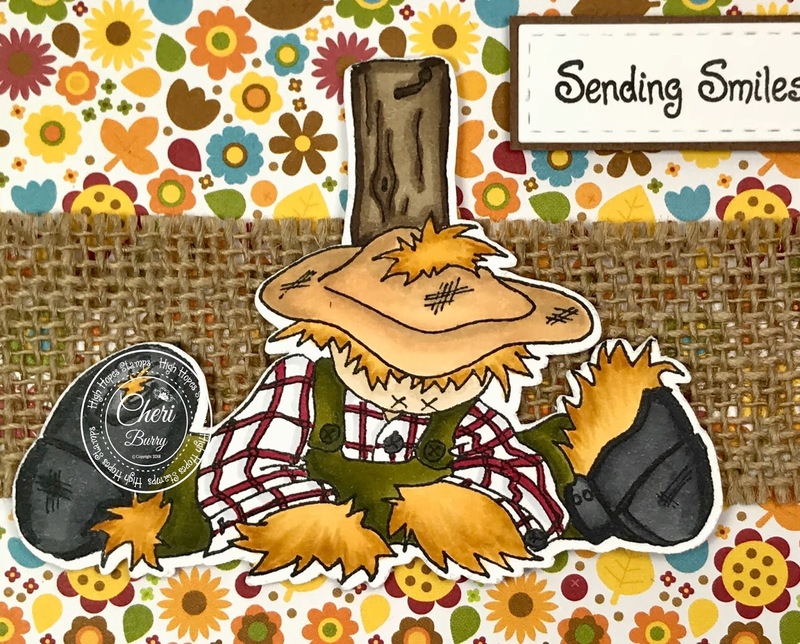 This card features one of my favorite images from High Hopes Rubber stamps. This is Canadian Christmas Greetings that I stamped on to Copic Xpress It cardstock with Memento ink and then colored with Copic Markers. I paired the image with Christmas paper from Photo Play, some red twine and a sentiment from My Favorite Things. 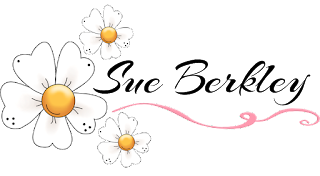 Today I am sharing something that's totally out of my comfort zone! 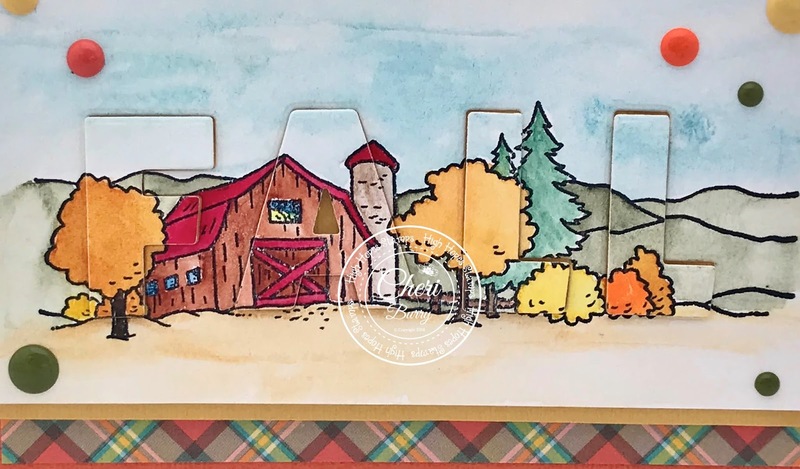 I tried my hand at watercoloring this beautiful image from High Hopes called "Farm Background" with a watercolour paper palette. I still need lots of practice but I have to admit it was fun! I started by stamping the image onto some watercolour paper and then using the palette, a brush and some water coloured it in. After it had time to dry I cut out the word "Fall" and added the letters back in with foam tape to create an "Eclipse" card. 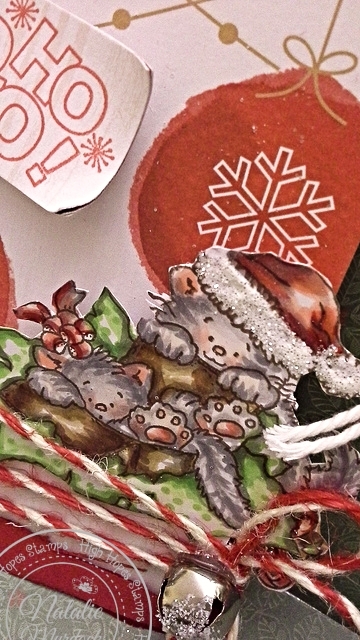 A bit of Designer Paper behind the image and some enamel dots finished it all off. The Watercolour Palette is basically a sheet of paper with some small dots of water-colour paint. It was neat to try the Paper Palette's and I think you could easily make your own to take easily with you. Made with Chilly Penguin found here! My sweet penguin was coloured with copic markers. 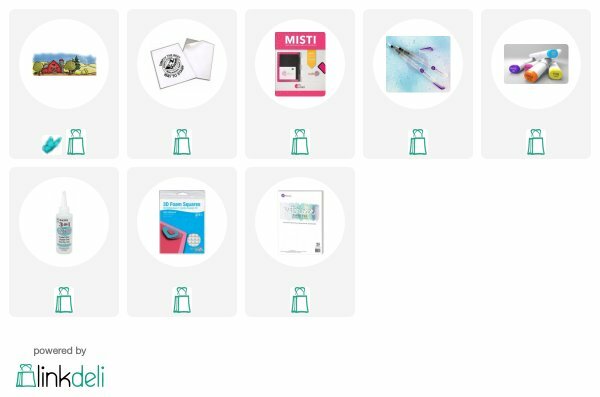 I made a little album by folding and scoring card stock. Printed some tiny photos and added them to the album. Made a sleeve using cardstock and soft white twine. 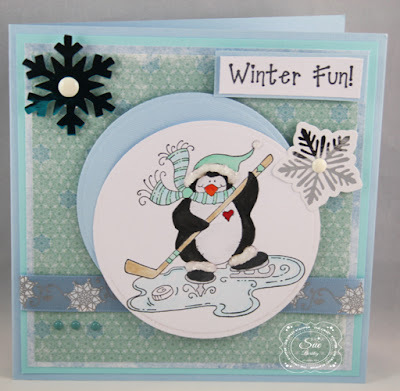 With the start of school and fall almost here, this brings the start of Winter fun and sports. Hockey is a big one with my grandchildren. They all play and can't wait for their season to start. 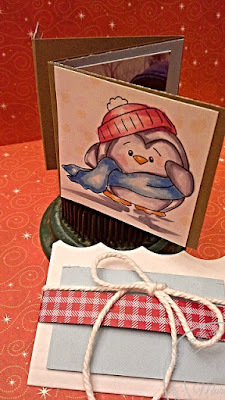 For today's card, I have used the adorable Penguin's Pastime stamp from High Hopes Stamps. Copic Markers were used to colour the image. 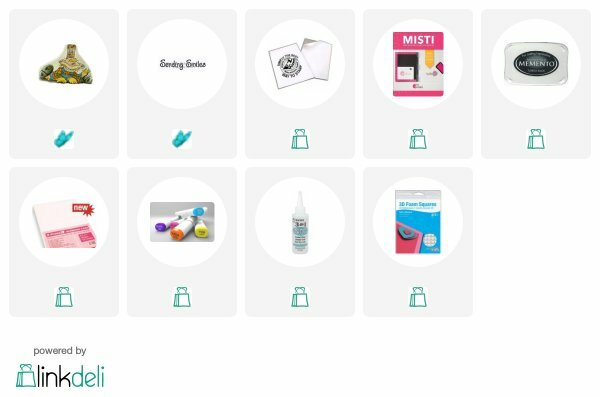 Silver foil, and Turquoise & Silver Foil, were used with the Heidi Swap Minc machine to foil the snowflakes. 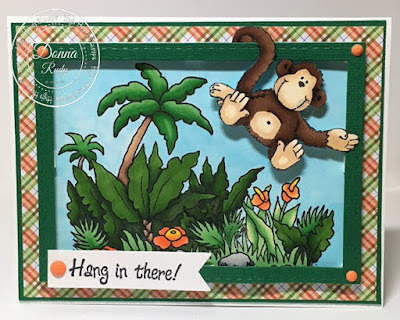 The design team is doing Anything Goes this week on the blog so I thought I would have some fun and monkey around a little! We all need some encouragement or to know someone is thinking of us once and a while so I decided that Monkey Mike would be perfect to help not only bring some encouragement but also a smile to someone. I think he is pretty cute and he makes me giggle! I tackled the jungle background first, colouring it with alcohol markers and then set it aside. Next I coloured up Monkey Mike and hand fussy cut him. 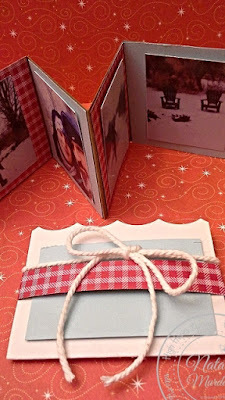 I found some matching plaid patterned paper and cut it and matching cardstock to fit my A2 size. 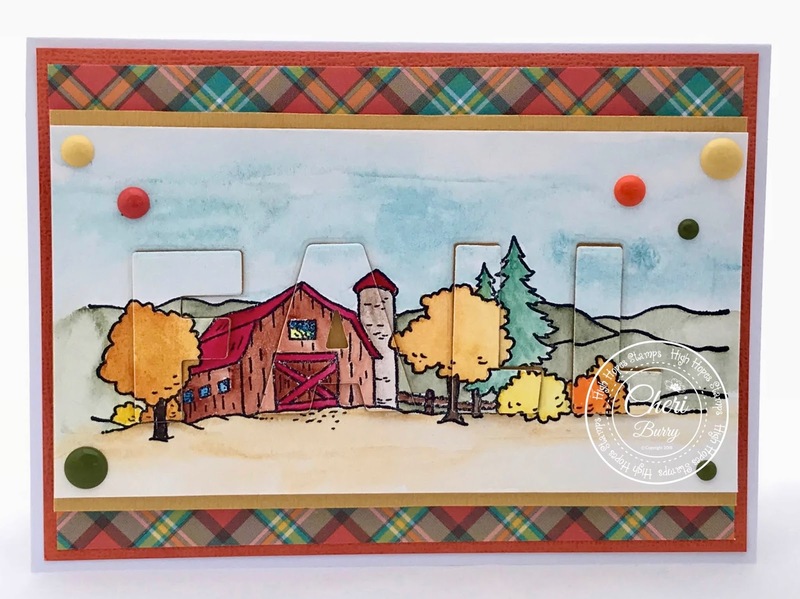 Next, I created a cardstock frame by using two different sizes of rectangle dies and added it on top of the background with pop dots. 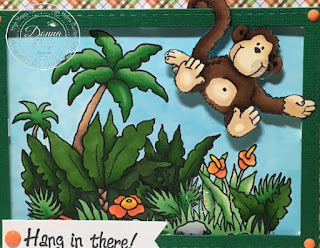 Then, I took our handsome Monkey Mike and hung him from the frame by his tail. He has a pop dot behind him too because he kinda tilted sideways when I hooked him up by tail. The sentiment was stamped and cut out with a fish tail banner die and a few enamel dots finish off my card. 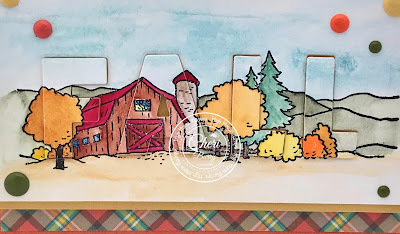 Today's card for One Crazy Stamper features two of my favorite images. Both were colored with Inktense Pencils and water brushes. I can just imagine the two of them getting in to all kinds of trouble. This is High Hopes Rubber Stamps Little Sleuth ( R205) and his sidekick Watson (M100). Both were stamped with Versafine Onyx Black ink on to water color paper, and then colored with Inktense pencils. Have a great day and be sure to check out the amazing projects all of the design team are sharing on this blog. Fall is in the air and with that comes all the adorable Fall stamps, papers and warm colours! Today for my post I am using "Harvest Harry". 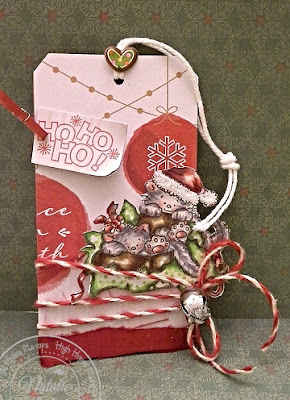 My Design is very simple today with only one layer of designer paper and a bit of Burlap ribbon. 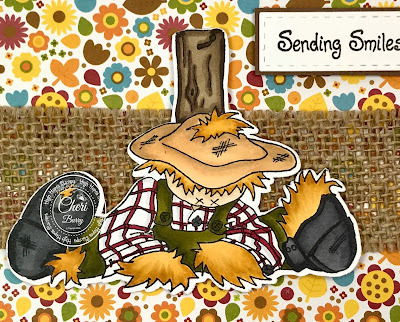 I coloured my image with my Copic Sketch markers and then fussy cut it out with my Brother Cut N Scan. I popped the image up with some foam squares and added a few enamel dots for a bit of interest. 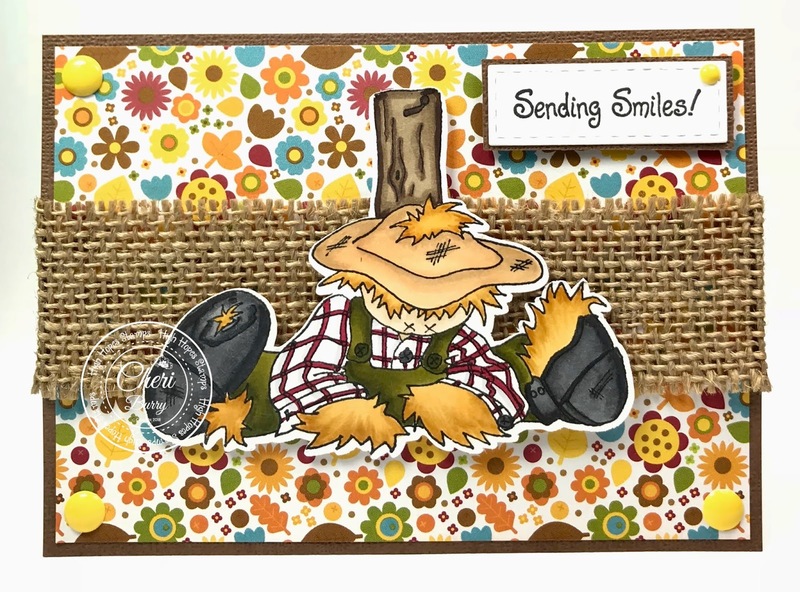 The sentiment is also from High Hopes and is called "Sending Smiles". 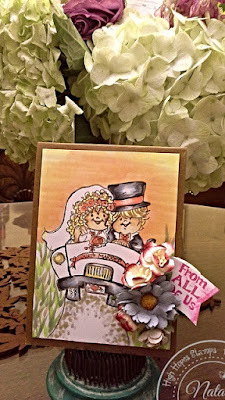 I'm back to share a little wedding card.